Reach the customers that matter most, for less. It’s direct mail made easy and affordable. Have a mail list of customers or leads that you want to reach? Select our traditional direct mail service. For decades, the billboard has remained a staple for advertising brick and mortar storefronts. However, there are some mobile businesses in which a form of alternative marketing is more successful: promotional flags. They are a simple and effective way to share your business logo and message. We offer a large selection of heigh options. For outdoor adventure companies, such as those that feature whitewater rafting to paddle boarding and other water activities, it’s important to find a marketing tool that is easy to read from a distance and is easy to relocate. Unlike the traditional billboard, advertising flags are the perfect transportable advertising essential. These advertising flags could be installed for a day or a few weeks and then moved to another area next. Because they can be used indoors as well as outdoors, their versatility allows them to be multi-purpose. 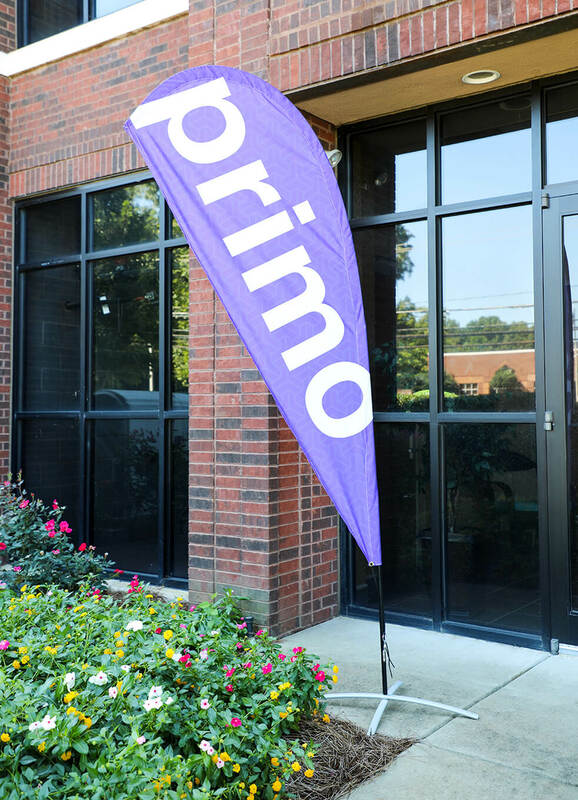 A business flag can not only be used for outdoor activities, but for sporting events, business trade shows, special events, and outside brick and mortar stores advertising a grand opening or promotion. They are teardrop or feather-shaped, printed on durable 3oz Polyester fabric, making them perfect for indoor or outdoor use. You can choose from 7ft, 9ft, or 11ft teardrop flags or 8ft, 10ft, 12ft regular, and 12ft jumbo feather flags. View our flag heigh chart, explaining the dimensions. Optional hardware is available; we offer a ground stake and pole for outdoor use and a pool and a pole and cross base for indoor use. If you purchase additional hardware, and hardware will be included in a convenient carrying case. They can be machine washed in cold water with a mild detergent, using the gentle cycle. No bleach should be used. In order to prevent fabric shrinking, tumble dry on low. Steam to release wrinkles if necessary. They offer the perfect canvas to share your brand and message. Show off your creativity! If you’re struggling with creating a design, our in-house designers can assist you in creating a captivating design and will walk you through the entire process. Promotional flags are an eye-catching advertising tool. They offer you versatility and the opportunity to travel with your brand. Using durable materials and a captivating message, it can help increase your business. Every Door Direct Mail®, EDDM®, Every Door Direct Mail – Retail®, and EDDM PLUS® are trademarks of the United States Postal Service®. Primoprint is an independent provider of printing services that is not associated, sponsored, or otherwise approved by the United States Postal Service to provide these services.